Looking for an agency that can create your ADA Friendly Website? You found us! When your website is properly designed and coded, internet users with various disabilities can still enjoy access to them. Many websites are developed with accessibility barriers that make them difficult or impossible for some people to use. At Find Local Company, we are committed to WCAG 2.1 compliant website design (ADA Friendly Websites) as part of our digital marketing services. This means making the web accessible to individuals, businesses and society, designing all our client websites to conform with international web standards for accessibility. Total web accessibility means that websites, tools and technologies are designed and developed in order for people with disabilities to perceive, understand, navigate, interact with and contribute to the internet. Find Local Company is proud to be a leader in WCAG 2.1 compliant website design. Your business website built and maintained by us will meet the latest standards to enable access by people with various disabilities. We can build your ADA Friendly website so contact us today! Although there are a number of state and federal web accessibility laws in place, the most widely adopted and comprehensive technical standards have been formulated by the World Wide Web Consortium (W3C), an online web development resource center. Their standards are called the Web Content Accessibility Guidelines (WCAG). The WCAG 2.1 standard is the most up-to-date guideline for creating accessible web content, having been released in June 2018. It is not mandated by law for all website designers and creators in the United States. However, it has been voluntarily accepted and employed by many American educational institutions. It has also been referenced by laws in 21 countries and the European Union. Lays out best practices for creating web content that is universally perceivable, operable and understandable. Defines the criteria that determines inclusive web design, along with ascending compliance levels (A, AA and AAA). Is written and reviewed by a global community of digital experts. Connects the global community through common information technology and user experience standards. The newest WCAG guidelines include 17 new standards that help people with cognitive or learning disabilities, those with low vision and all mobile users. 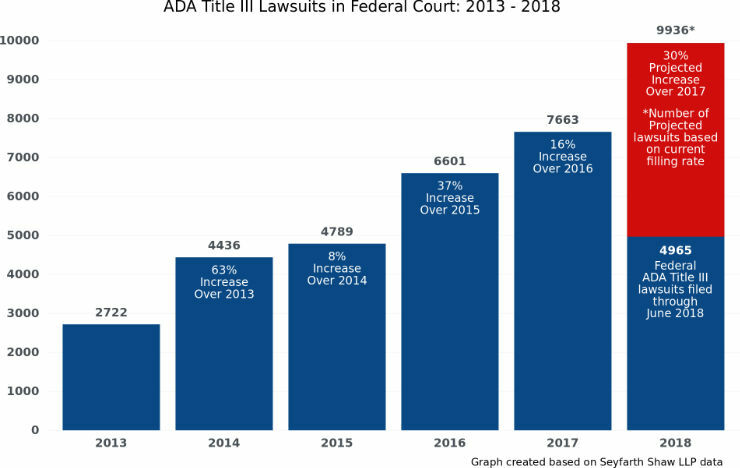 The Americans with Disabilities Act (ADA), which became law in 1990, prohibits discrimination against individuals with disabilities in all areas of public life. In January 2018, some new federal regulations took effect. All federal institutions’ websites must meet at least Level AA compliance on all items in WCAG 2.0 by this time. Moreover, any business that is considered a “public accommodation” should have an ADA Friendly web presence. “Public accommodation” could apply to many things, but it is generally accepted that retail, B2C or any business the general public should be able to use, would be included. Find Local Company’s WCAG 2.1 compliant website design practices ensure that all our client’s sites meet and exceed this requirement. Find Local Company believes everyone should have unlimited access to the internet and all it has to offer, and that includes people with disabilities. Moreover, it is part of our top-tier level of service to your company that we design and build your website to conform with all applicable laws. As your digital marketing partner that is our responsibility, and we take it seriously. Would you like to know more about WCAG 2.1 compliant website design? Perhaps you are interested in our many digital marketing services that work together seamlessly to generate a growing number of leads and conversions for your business? Speak with us today by phone or by completing the online contact form.